Three years ago, the two artists met and read through music together to see whether they could collaborate; it was an instantaneous feeling of mutual ease and inspiration. Audiences who have been spellbound by Ms. Schiff’s “sensational violin talent” (San Francisco Chronicle) and her “complete mastery of the violin” (London Daily Telegraph) will be eager to hear her passionate interpretations in tandem with Lois Brandwynne’s artistry. This is a duo not to be missed! The Schiff/Brandwynne Duo can be reached through Ernst Valfer, Artists Representative, 510-849-4724, Fax 510-549-2260. One of the very few protégés of Jascha Heifetz, Zina Schiff has dazzled audiences throughout North America, Eastern and Western Europe, Israel, Australia, and New Zealand. 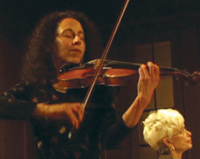 In the United States, Zina has soloed with such major orchestras as Philadelphia, Baltimore, Washington, Rochester, Brooklyn, San Antonio, Nashville, San Diego, Los Angeles, Seattle, and San Francisco. Ms. Schiff’s many awards include the Young Musicians Foundation Debut Award, the San Francisco Foundation Award, and a grant from the Martha Baird Rockefeller Fund for Music. She was selected as an Outstanding Young Artist by Musical America and honored as a Distinguished Alumna by Louisiana State University in Shreveport, where she earned her masters degree in liberal arts. Ms. Schiff’s recording debut was with the Israel Philharmonic—A Bach-Vivaldi Album and The Lark Ascending by Ralph Vaughn Williams. Zina’s CDs, including King David’s Lyre, were selected as Critics Choice Best of the Year by the American Record Guide. Her most recent recordings are The Golden Dove—Masterpieces from the Russian Jewish Folk Music Society and Elijah’s Violin.